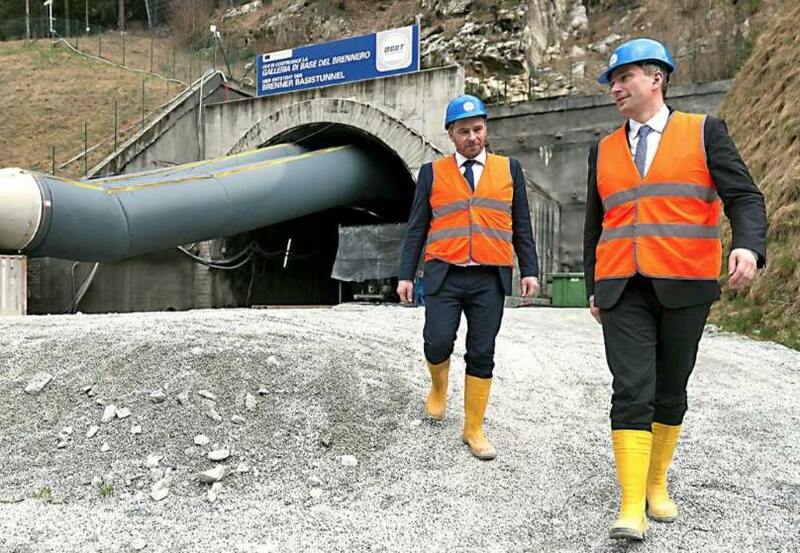 The Minister for Transport of Saxony, Martin Dulig, the Deputy Minister for Transport of the Czech Republic, Kamil Rudolecký, and the European coordinator for the Orient/East-Med corridor, Mathieu Grosch, have paid the Brenner Base Tunnel a visit. The reasons for the visit lie in the project for a new rail tunnel, 23 km long, linking the towns of Heidenau in Saxony and Stradov in the Czech Republic. Thanks to this rail link, travel times between Dresden and Prague will be reduced to a mere 50 minutes. During the course of the two-day visit, the guests were shown around the tunnel construction sites at Mules and Ahrental. Arno Kompatscher, President of the Autonomous Province of Bolzano, and Günther Platter, President of the Land Tirol, gave their welcome to the delegation in Bolzano and Innsbruck respectively. Together, they discussed many of the aspects related to the project: the scope, the expectations of the local population, funding, measures of environmental compensation and stakeholder involvement. Deputy Minister Rudolecký summarises the outcome of the visit as follows: “Here at the Brenner we can see how one prepares for a project of this kind – which are the fundamental elements to keep in mind, beyond the issue of funding”. The final statement of Minister Dulig: ”I hope that someday I will have the honour of visiting, or even inaugurating, a construction site of such relevance. We have seen that the involvement of the local population and maximum transparence are of uttermost importance”.